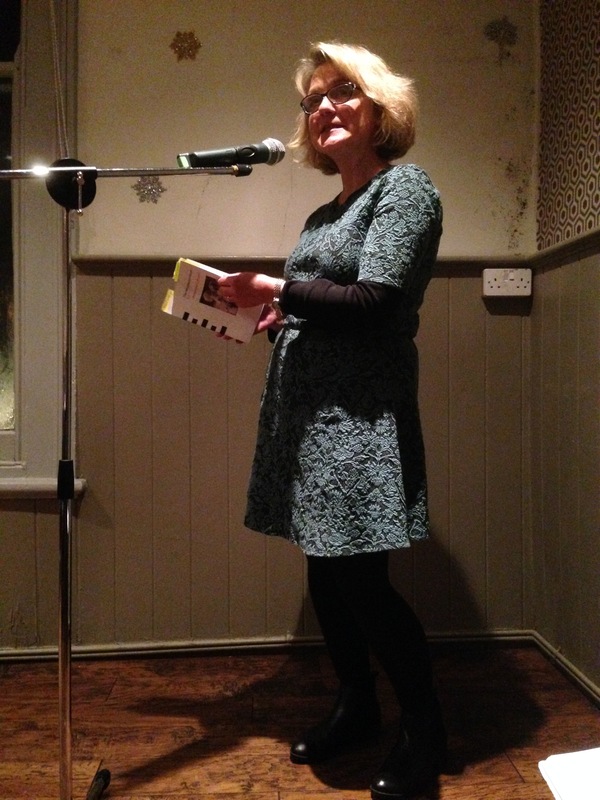 I was lucky enough to read at Buzzwords in Cheltenham last Sunday night. Cheltenham is about an hour and twenty minutes away by car and Andrew, my husband, kindly offered to drive. It might sound strange, but sometimes car journeys are the only times we spend quality time together these days. Andrew tends to work away during the week and weekends are often pretty busy. Anyway, it’s great that he doesn’t mind driving. He ended up staying for my reading and the open-mic, driven to poetry by a rather loud pub quiz taking place in the main part of the pub. Because of work commitments and because we don’t like to leave our two teenagers alone too long, it was the first time he’d heard me read from my pamphlet, The Misplaced House even though it was published over a year ago. I’m pleased to say that he really enjoyed the evening! It was great to talk about the poetry on the way home in the car, and hear Andrew’s feedback on some of my newer poems. It was really interesting to hear his thoughts about the open-mic poems we heard, too, and to compare which ones we remembered and liked. It’s always useful to do this and just confirms to me how arbitrary opinions are. It puts the logic of submissions, acceptances and rejections, into perspective. Buzzwords is a terrific reading series, I really recommend it if you ever have a chance to go. It’s beautifully managed and compèred by Angela France and it’s held in a spacious room above the Exmouth Arms pub (which was hospitable and very comfortable). I was made to feel so welcome by a very friendly crowd. I led a workshop for the first hour then there were about 30 minutes of open-mic poems, a 20 minute slot for me, a break to buy drinks and books (really pleased that I sold ten pamphlets), then another open-mic session followed by a final 20 minute reading by me to close the evening. The standard of poems at the open-mic is high which is hardly surprising considering Alison Brackenbury, Cliff Yates, David Cooke, Lesley Ingram, Rosie Jackson, Dawn Gorman (and many others I’ve probably forgotten to mention) are regular members of the monthly series. An absolute pleasure to be among such wonderful listeners, too. In other news, I’ve had a poem taken by New Walk which should be out around April, so that’s two print publications forthcoming in 2016 (Poetry Wales has taken two poems, as well). Really pleased about this, after a not brilliant year last year. I think I’m even more pleased that my rejections bother me less. I still get down but I seem to be recovering more quickly. Progress! My diary has also been filled with reading through poems submitted to And Other Poems during a brief open window last year. The standard is even higher than usual which is fantastic but it means that I’m having to turn down some poems because there isn’t space (I publish two poets a week). I’m trying to forge ahead with reading the submissions but find I need to stop after about five poets (to be fair to every poem) so, please bear with me if you’re waiting to hear from me. 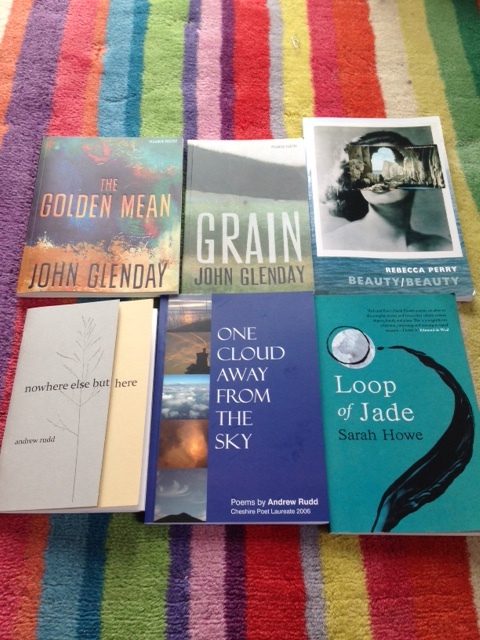 Poetry collections I’ve been reading over the last few weeks include Sarah Howe’s Loop of Jade, Rebecca Perry’s Beauty/Beauty, John Glenday’s Grain and The Golden Mean and One Cloud Away from the Sky and nowhere else but here by Andrew Rudd. What pleases me most is the range of styles and subject matter in each book. I’m trying to find my way in to write some new poems and each poet is offering me options and ideas. Wishing you all a productive, cheerful, peaceful week, whatever you’re up to! It was lovely to meet you, hear you read, benefit from your workshop and buy your pamphlet, Josephine. Thank you for coming to Cheltenham to read for Buzzwords’ devotees … and, as always, a big thank you to Angela France. Hi Josephine, It’s lovely that Andrew got a chance to hear you reading. My husband has come along to all my events in the role of ‘roadie’ and has enjoyed seeing me perform in a different context and the shared experience has been great for moral support. Great to hear that Andrew was with you on this journey. Family can be the harshest critics and the most caring!